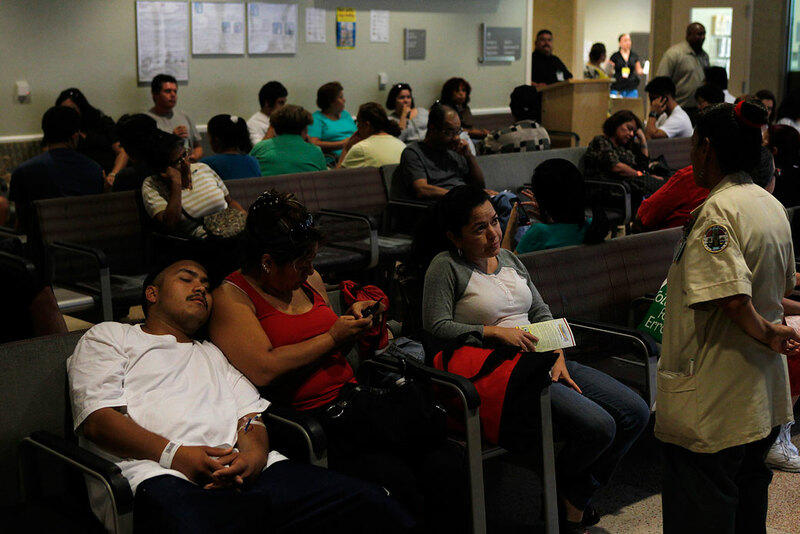 Patients wait to see a doctor at an emergency room in Los Angeles, September 2011. Compared with other developed nations, the United States spends far more on health care yet performs no better on many measures of health.1 Moreover, health care spending in the United States continues to outpace economic growth. By 2026, $1 of every $5 spent in the American economy will go toward health care.2 One of the main reasons Americans receive relatively little value from their health care dollars is that the price paid for care is higher—and that cost is rising more rapidly than those in other industrialized nations.3 Prices for medical care have generally risen faster than overall inflation, even for common procedures such as appendectomies and knee replacements.4 Any serious effort to bend the cost curve must address the prices Americans currently pay for health care, including the price markups that result from insufficient competition in U.S. health care markets. Put simply, less competition leads to higher prices for care. 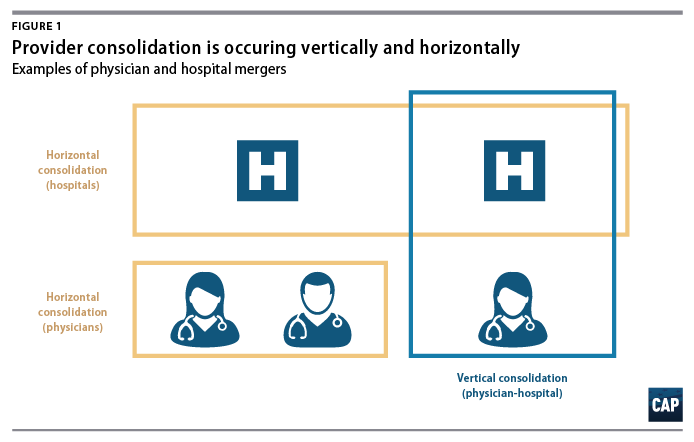 Health care industry firms involved in merger activity often claim that consolidation will result in greater efficiency, lower costs, and more coordinated patient care. However, research shows that such efficiency often does not materialize; even when it does, savings are not passed on to consumers. Economic theory indicates that when many similarly sized firms are present in a market, their competition for consumers keeps product prices low. Concentrated markets, those with just a few competitors or in which a small number of firms control most of the sales, generally have higher prices. In concentrated markets, firms wield market power and have control over prices and supply. In some cases, concentrated markets arise naturally. The population of a rural county, for example, may be too small to support more than one medical clinic. In other cases, market power can fuel concentration. Firms may drive out rivals by providing better care or lower prices; by developing loyalty to their brand; or by engaging in anti-competitive, unfair business practices. Another way markets can become concentrated over time is through consolidation, as competitors combine to form a single firm through mergers or acquisitions. In addition to consolidation between like firms—hospitals acquiring other hospitals or pharmacy chains merging together—the health care sector is also experiencing increased vertical consolidation, that is, integration among companies that provide different sets of services. While examples of concentration in the health care sector are rife, this report focuses on health care providers, namely hospitals and physician practices, and the consequences of consolidation in that arena. In 2016, the United States spent $1.7 trillion on hospital care and physician and clinical services, which together accounted for more than half, or 52 percent, of the nation’s health expenditures that year.14 This report discusses how health care provider markets are becoming increasingly concentrated, as well as the implications for both payers and patients. Strengthen enforcement by antitrust agencies. Bring down prices in already concentrated markets. Progress in all three of these areas is crucial. Many popular policies to promote competition—hospital price transparency and rural telehealth, for example—do not directly address the elephant in the room: market power. The effectiveness of solutions in the first two categories relies on the ability of purchasers of health care—that is, insurers, employers, and patients—to make choices in a competitive environment, which many areas of the country lack. Conversely, regulations that cap provider rates prevent monopoly-level pricing but do not generate competition. Robust competition and a dynamic market can drive innovation and improvements in health care. Mergers are ultimately a business decision, however, and policymakers should be doing do more to ensure consumers’ interests are protected. When a small number of firms control most of the business in a market, that market is said to be concentrated. In health care, this could be a city with just two health care systems or a hospital that accounts for 60 percent of a city’s inpatient admissions. High levels of market concentration alone are no guarantee of noncompetitive outcomes, but a large body of research documents well-defined circumstances where that is the case.15 A common measure of concentration known as the Herfindahl-Hirschman Index (HHI) is calculated from each firm’s share of a market. At the high end, a market with a monopolist, the HHI score is 10,000; a market split evenly between two firms has an HHI of 5,000; and a market with 10 equally sized firms would have an HHI of 1,000. The federal governments’ chief antitrust enforcement agencies, the DOJ and Federal Trade Commission (FTC), define highly concentrated markets as those with an HHI above 2,500, a level that results from, among other possible configurations, four firms each holding a quarter of the market. Rural areas of the country also suffer from scant competition, though concentration in those communities often results from too few providers rather than consolidation. About 1 in 5 rural counties has no hospital at all, and half lack a hospital with obstetric services. 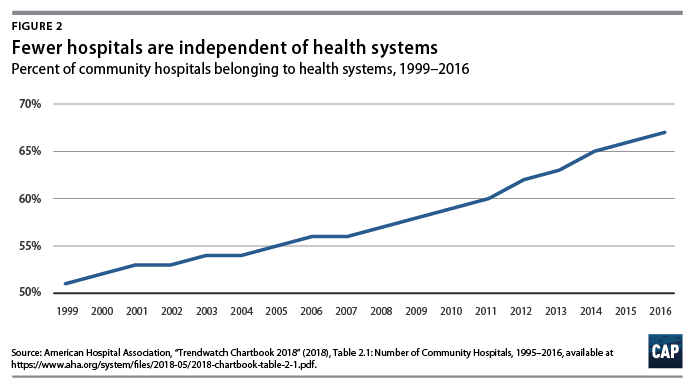 19 In 1980, the country had 5,830 community hospitals;20 the most recent count is 4,840.21 Moreover, the number of hospitals in the United States has declined over the last three decades because of closures, mergers, and acquisitions. The FTC has the chief antitrust enforcement power over health care providers, and its history of health care challenges has had its ups and downs. The FTC lost several cases in the mid- to late-1990s, a period when, in the words of former FTC Commissioner Julie Brill, the FTC’s “hospital merger work had hit an iceberg.”53 In response, the agency invested heavily in a retrospective analysis of hospital mergers to amass evidence on the effects of consolidation and revamped its strategy for future enforcement cases. While the FTC’s success in blocking health care mergers has picked up over the last two decades, the unflagging pace of consolidation in the industry suggests that the agency’s efforts are having little deterrent effect. Second, large health systems have been able to acquire smaller practices without attracting scrutiny, because such small transactions typically have not exceeded federal antitrust agencies’ thresholds for increased concentration or change in concentration that trigger an extensive review. As economists Cory Capps, David Dranove, and Christopher Ody observed in their recent work, “antitrust authorities are less likely to investigate a $20 billion firm buying ten $1 billion firms than a similar firm buying a $10 billion firm.”82 Nevertheless, the cumulative effect of numerous small transactions can be highly consequential for the competitiveness of the market. In the face of increasing consolidation, squeezing greater value out of Americans’ health care dollars requires improvements in three areas. First, antitrust agencies need to step up monitoring and enforcement and should be given the resources to do so. Second, states and the federal Centers for Medicare and Medicaid Services can take actions to enhance competition among existing firms. Lastly, because some markets simply lack robust competition, the local nature of health care services demands that policymakers directly address access and affordability problems through price regulation. Federal and state antitrust authorities are in the best position to slow anti-competitive consolidation, but to be more effective, they need sharper legal tools and greater financial resources. Antitrust authorities should also consider reviving their use of structural presumptions,88 defining scenarios in which mergers are to be presumed illegal based on their effect on market structure, such as a merger between two rivals that together would control a large share of a market. In such cases, the merging parties would bear the burden of proving the deal is pro-competitive and its benefits are merger-specific. In contrast to an environment in which antitrust authorities are largely responsible for demonstrating anti-competitive effects, greater use of structural presumptions could slow consolidation and help weed out mergers that harm competition. State antitrust enforcers should take a larger role in monitoring health care competition, especially in cases where mergers are too small to merit FTC review or challenges. Moreover, states know their local markets best. The FTC should establish an ongoing program to backstop states’ efforts by offering technical assistance. 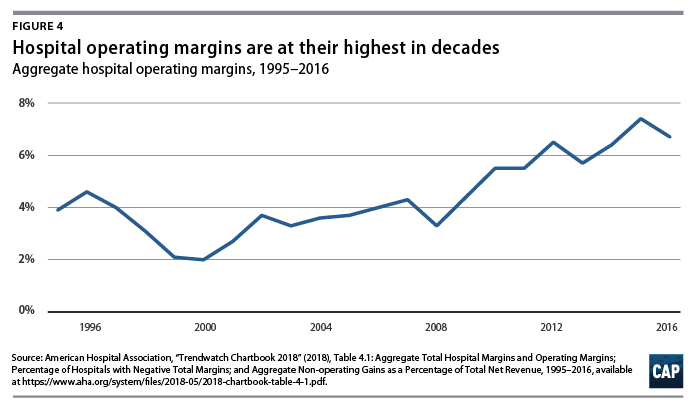 Given the rise in vertical consolidation and the potentially overwhelming market power of the megafirms emerging from it, the FTC should invest more in understanding the consequences of vertical integration in the health care industry, including retrospective analysis of the effects of physician-hospital consolidation on the cost and quality, as well as consumers’ access to care. As part of its review of the evidence, the FTC should consider whether vertical integration dampens innovation, prevents the entry of new firms, and leads already dominant health systems to extend their market power. The FTC should also issue updated guidelines for vertical merger review across all industries. The parties engaging in vertical deals should bear the burden of proving that the increased efficiency and other beneficial results from the transaction are merger-specific and could not be obtained through other forms of collaboration. While policymakers should allow space for integrated business models to flourish, especially as value-based payment models replace traditional fee-for-service reimbursement in health care, new entrants cannot take root when the market is highly concentrated. In addition, federal antitrust agencies have existing powers to challenge vertical mergers and bring cases against anti-competitive behavior resulting from vertical integration. The FTC and DOJ should consider making broader use of their authority under the Sherman Antitrust Act to stop conduct such as price fixing and erecting barriers to entry. For example, refusing to deal with competitors or threatening to cut off suppliers or customers who do business with a competitor can be a violation of antitrust rules.91 If a vertically integrated health care system uses its position to discourage physicians from referring patients to outside hospitals, agencies should consider bringing a refusal-to-deal case in such a situation. Beyond antitrust enforcement, the federal government and state governments can take steps to enhance competition among providers and eliminate policies that inadvertently reward mergers not rooted in providing more efficient, higher-value care. One way that dominant providers maintain hold on their market power is by striking anti-competitive agreements with insurers, which act to keep rates artificially high and prices secret. A recent investigation by The Wall Street Journal found “dozens of contracts with terms that limit how insurers design plans,” including those involving leading health systems.101 Some states have already acted against such practices. Forty-two states require that hospital price or charge data be public, and 18 have banned so-called “most favored nation”(MFN) clauses, in which a provider guarantees no other insurer will get a lower rate.102 States should take further action to ban gag rules and nondisclosure agreements in provider contracts, which prohibit the sharing of pricing information. Many other anti-competitive state laws remain on the books, however. Nine states have “any willing provider” clauses for health care providers, which prevent health insurance plans from excluding providers from their networks.103 In addition to repealing such statutes, states can also foster competition via insurance networks by repealing anti-tiering and anti-steering clauses, which hamper plan designs that direct patients toward higher-value providers. At the federal level, the CMS should ban providers who engage in MFN, anti-steering, and anti-tiering clauses in provider contracts, from participation in Medicare. Medicare has historically reimbursed services performed in a hospital at a higher rate than those administered in a physician’s office. For services where comparable care can be provided in either setting, this payment differential rewards health systems for shifting services into the hospital environment, ultimately driving up costs and wasting resources.104 Closing the payment gap would eliminate the incentive for hospital systems to gobble up physician practices in order to bill for services under the hospital outpatient payment schedule. It would also enhance competition between hospitals and other providers of outpatient care. A second major category of restrictions on provider competition that states should repeal is certificate-of-need (CON) requirements. CON laws, which require hospitals or other inpatient care facilities to obtain permission from state agencies in order to enter a market or build a new facility, are a relic of state attempts to control health costs in the 1970s by limiting hospitals’ capacity. The argument behind CON laws was that hospitals raise prices for care to cover their fixed costs when they have excess capacity. In areas of the country lacking sufficient competition, market-based solutions for controlling prices break down. Some places are dominated by a single major health system, while other markets are too small or sparsely populated to support competing hospitals or specialty providers, or to attract any at all. In such markets, “Empowering consumer choice is of little benefit where choice is lacking.”120 Bringing down health care costs and ensuring access to care requires policies to address extant market power. The U.S. Department of Health and Human Services (HHS) should house an ombudsman to serve all Americans on issues of health care costs and access. Such public advocates already exist for other issues on the state and federal level, including the IRS’ taxpayer advocate.121 While the CMS has an ombudsman serving Medicare beneficiaries, this new office would create a centralized point of contact for health consumers to file complaints and requests.122 The ombudsman would also advocate for patients and taxpayers by assessing regulations for their impact on the cost and quality of health care. Coupled with increased efforts by HHS to monitor provider competition and rates, the office could halt and deter anti-competitive conduct by insurers and providers by uncovering instances where patients and competitors were treated poorly or unfairly. Another more direct way to lower prices for consumers is to set limits as a percentage of Medicare rates. Medicare Advantage already requires that all out-of-network providers accept at least Medicare fee-for-service rates,128 essentially capping rates. A recent working paper from the Congressional Budget Office suggests the rule not only results in less variation in rates but also lowers both the in-network and out-of-network rates that commercial insurers pay in Medicare Advantage.129 Congress could extend a Medicare rate-based cap to all services from providers who participate in Medicare, regardless of the payer. In a bolder approach to regulating rates, the government could set payer rates to level prices among payers. Setting all-payer rates across providers would ensure fair prices for consumers while still allowing providers to compete for business from patients and insurers along other dimensions such as overall cost, clinical outcomes, and patient experience. Regulators could adjust rates or create supplemental payments as needed to guarantee that Americans in underserved communities have adequate access to care services. It is time to stop presuming that consolidation in health care will be innovative and pro-competitive. Deals that are good for business are not necessarily in consumers’ best interest. The loss of independent hospitals represents a loss of choice for patients, and lower costs for health systems do not translate into lower prices for patients. 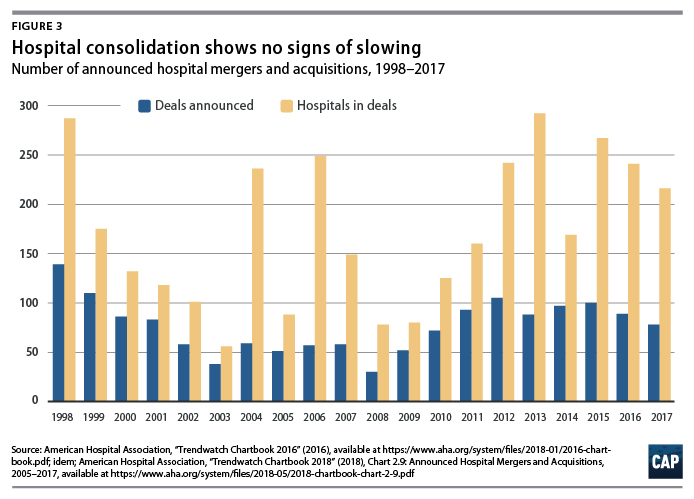 As economist Martin Gaynor recently pointed out in a congressional hearing, “Since consolidation in health care has been occurring for a long time, it seems unlikely that the promised gains from consolidation will now materialize if they haven’t yet.”135 Antitrust authorities, whose efforts to protect competition in recent years have been stymied by inadequate resources for pursing merger challenges and monitoring conduct, should subject mergers to greater scrutiny and should be given the resources to keep abreast of the developments in health care markets. The current state of health care provider markets demands stronger enforcement by federal and state antitrust authorities, policies to support more robust competition among providers, and limits on prices in already concentrated markets. Any efforts to control health care costs and improve care for patients should consider the growing role of market power. Emily Gee is the health economist of Health Policy at the Center for American Progress. Ethan Gurwitz is a law student at Harvard Law School and was formerly a policy analyst for Economic Policy at the Center. Aditya Krishnaswamy, Nikki Prattipati, and Rhonda Rogombe provided research assistance.